Northern Ireland residents could take a Cabinet seat next year, Downing Street has suggested. No Conservative and Unionist MPs were subsequently elected but two local lords, David Trimble and Reg Empey, take the Conservative whip. 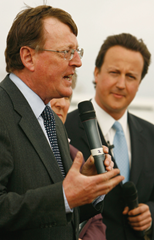 Trimble was previously mooted as a possible Attorney-General and both men are well- regarded in Westminster. A reshuffle is expected in March or May 2012. Cameron visited each of the devolved administrations soon after the Coalition Government was formed, calling at Stormont on 20 May 2010. Since then, he has visited Scotland twice and Wales three times. These included Conservative spring conferences in Cardiff and Perth. Last year’s Conservative manifesto stated that the Prime Minister and other ministers will go to the Scottish Parliament “for questioning on a regular basis.” Several Cabinet ministers have done so. “The Prime Minister has made it clear that Government is keen to work with the devolved administrations as part of the respect agenda,” the spokeswoman added. During Prime Minister’s questions, David Cameron said dissidents could not deter the wishes of the “overwhelming majority that want a peaceful future” in Northern Ireland. Strangford MP Jim Shannon had called for Cameron to give guarantees that the dissident threat would be dealt with forcefully. The Prime Minister commented that the PSNI has been funded “appropriately” and had been working well since devolution. Tributes from across the political spectrum poured in following the death of former NIO Minister David Cairns in May. The 44-year-old Labour MP and former Catholic priest made history when he was elected to Parliament in 2001 as his election prompted a change in the law that banned Catholic priests from taking a seat. Northern Ireland was briefly added to Cairns’ Scotland Office responsibilities in 2006 and 2007. He oversaw agriculture, regional development and the environment. Foyle MP Mark Durkan said Cairns was a “hard-working MP with strong views on a range of issues”. He added that as a backbencher he found him to be a “sound friend even if we differed on policy issues”. Paying tribute, East Antrim MP Sammy Wilson recalled that Cairns “served with distinction”. Some 56.3 per cent of Northern Ireland voters rejected the alternative vote system for Westminster elections. It was announced that 372,706 people here voted against electoral reform while 289,088 supported the campaign. Northern Ireland, though, was the most sympathetic region towards the Yes campaign (43.7 per cent).